Sebastian Vettel’s 5th victory of the year brought some cheer to Ferrari (NYSE:RACE) who had seen their championship hopes dashed in the races since the Summer break. No driver has beaten a MercedesAMG rival in the championship since the V6 hybrid turbo era began but Mr. Vettel is likely to become the 1st unless Mr. Bottas has a lucky weekend in Abu Dhabi in 2 weeks. Although the cards came favorably for Mr. Hamilton in the race, Mr. Bottas will surely be dismayed at seeing his team mate finish just 2.7 secs behind him after starting last’r than last from the pit lane. Between them both MercedesAMG drivers squandered chances to win the Brazilian Grand Prix. MercedesAMG have not won 4 consecutive championships by giving victories away. But this, their 7th defeat of Y 2017, was undoubtedly the win which got away. 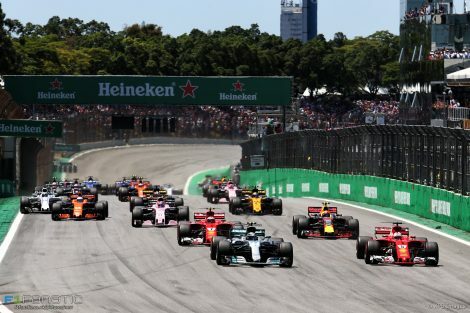 In the scorching heat of Interlagos, where track temperatures hit 60C at the start of the race, the W08 was quick enough to win. But errors by both its drivers let Sebastian Vettel in to claim his 1st victory since the Summer break. Mr. Hamilton had taken himself out of realistic contention for victory by crashing in qualifying. Meanwhile team mate Valtteri Bottas lost his advantage from The Pole position within moments of the start. The last time Mr. Bottas started from The Pole position, in Austria, Mr. Vettel was also alongside him. And the Ferrari driver was stunned by how quickly the MercedesAMG driver reacted to the start. This time the 2 cars pulled away as if they were connected to each other. But as the acceleration kicked in the Ferrari began to gain ground, Mr. Bottas not finding as good traction. Mr. Vettel might have been discouraged from trying a move had Mr. Bottas been as aggressive as, say, Mr. Vettel was in Singapore. But Mr. Bottas was more conservative and Mr. Vettel claimed space for himself on the inside of Turn 1, securing the lead of the race. As they accelerated out of Turn 2 Mr. Bottas again did not have the grip to stay with the Ferrari. Within a few moments Mr. Bottas call off his pursuit of Mr. Vettel, as 2 separate accidents had left 3 cars stranded on the side of the track. At Turn 2 Kevin Magnussen had squeezed Stoffel Vandoorne into Daniel Ricciardo. The Red Bull Racing driver spun around but it was the other 2 who sustained race-ending damage. All 3 were cleared of responsibility. At the same moment the Safety Car was deployed Esteban Ocon and Romain Grosjean were disputing the apex of Ferradura. The Haas driver had the inside line but skidded wide, the result, he later claimed, of a tire deflating due to contact at the 1st corner. He took the Force India off with him and left Mr. Ocon with a puncture which prevented him from returning to the pits, ending his career-long streak of race finishes. Mr. Grosjean continued but was given a 10-sec penalty.